Meet the award-winning G-Hold. 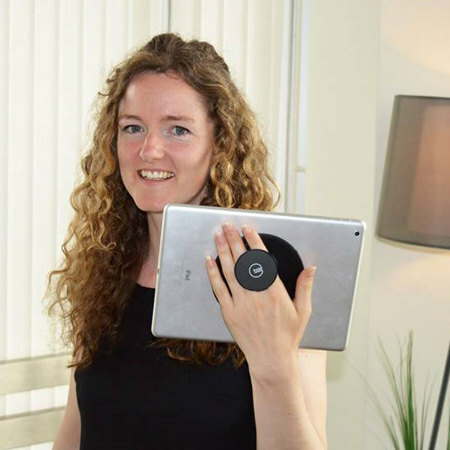 A reusable tablet and smart device holder that you enables you to hold your tablet with one hand easily for long periods. Perfect for reading, browsing, work use, travel and much more besides. Folds flat when not in use. Bought for my brother while he is in hospital. Really helpful! Modern tablets and e-readers are great. There are so many uses for them, whether at home reading books, browsing the internet, following recipes, playing games, drawing or shopping - or at work, checking data, emails and video calls. The only problem is that they're usually larger devices that can be uncomfortable to hold after a period of time. Meet the award -winning G-Hold. 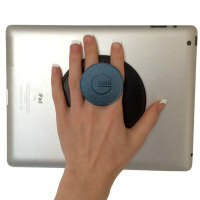 A holder that's making using tablets at work, rest or play a piece of cake. This is a universal holder and will work with any tablet, e-reader or even large smartphone. This includes iPads, Kindles, Surface and so on. 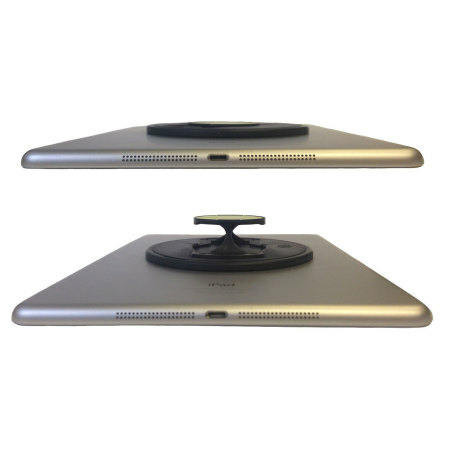 The patented design on offer here features a super adhesive surface that has thousands of suction craters that grip and hold your tablet like no other. Even if you want to grip a textured leather surface, on a case for instance, there is an application sticker included that can be applied to your tablet or case to provide a smooth surface for the G-Hold to grip. The real beauty of this design though is that it is fully reusable. There's no real reason to remove your G-Hold, but should you want to, it will grip next time you use it just as hard. This is serious grip and needs to be as you don't want your valuable device falling on to Terra Firma any time soon, naturally. 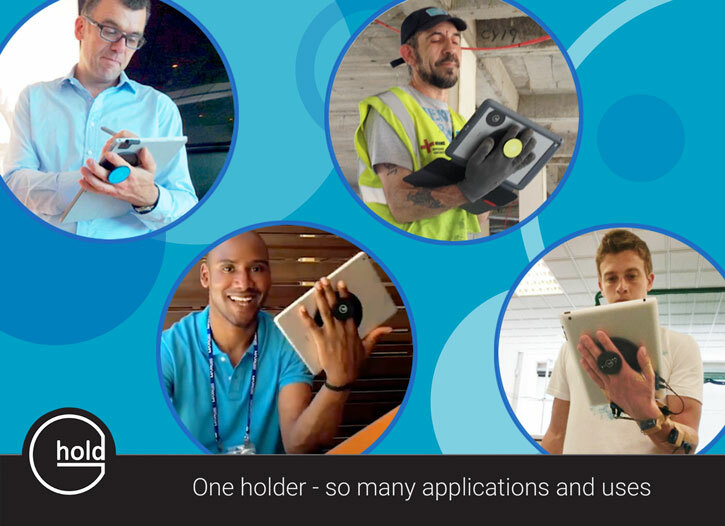 With a comfortable and safe grip with one hand, you can have a free hand available at all times to operate your tablet. 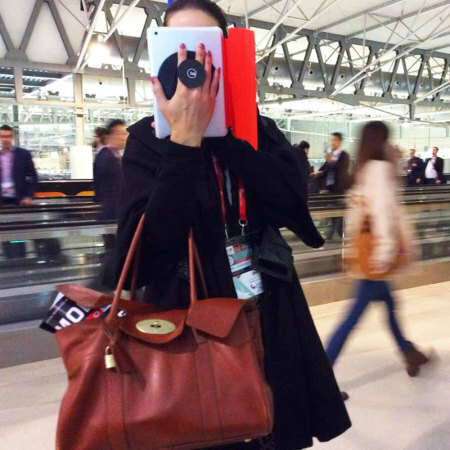 There is no conceivable use for a tablet where this would not be an attractive option. You may be presenting to a room and want to refer to your tablet for notes, or following a recipe on screen with your free hand operating kitchenware or simply enjoying reading or surfing the internet. You don't have to balance your tablet on your lap, the edge of a sofa or on a stand. 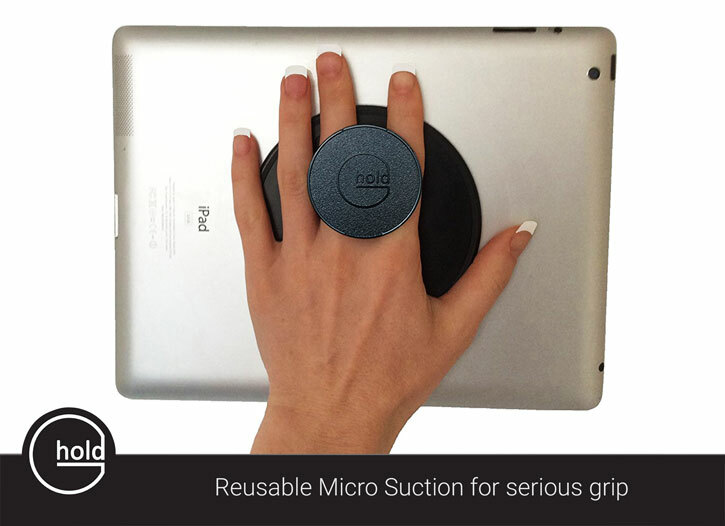 Your finger slides through the G-Hold and you have the perfect grip and control of your device. Simple. It's also significantly less likely to slip from your hand, meaning your less likely to damage it too. 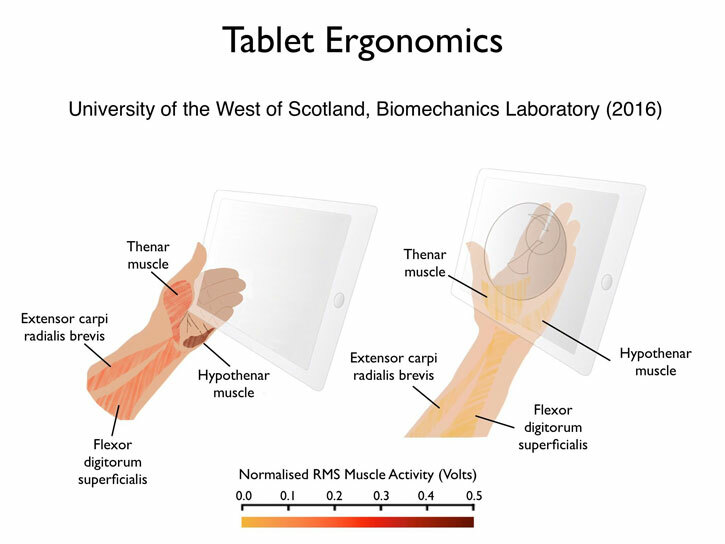 Without using a holder like the G-Hold, where you would have to hold your tablet in a pinch like grip with one hand, while using another to operate it, it places increases strain on certain muscles in your hand, as well as being off balanced. This isn't just marketing speak as there is scientific research to support this. 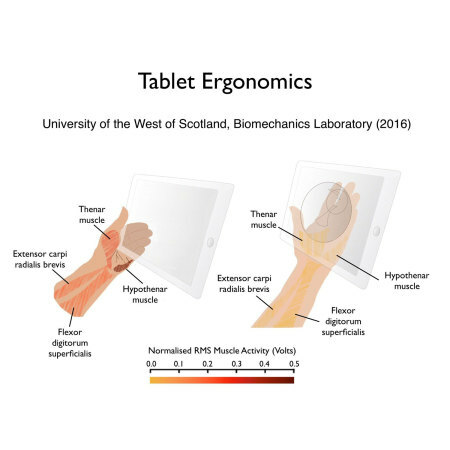 By using the G-Hold, not only will you have a more secure grip on your tablet, with far more control and freedom (even on the move), you will also experience very little or no strain from using your tablet for long periods. Tablets are pretty smart and they know when they're being rotated and of course you're going to want to do that occasionally. Switching between landscape and portrait is part and parcel of using a modern smart device after all. Don't worry, the pivoting mechanism in the G-Hold can rotate 360 degrees and stay in place. 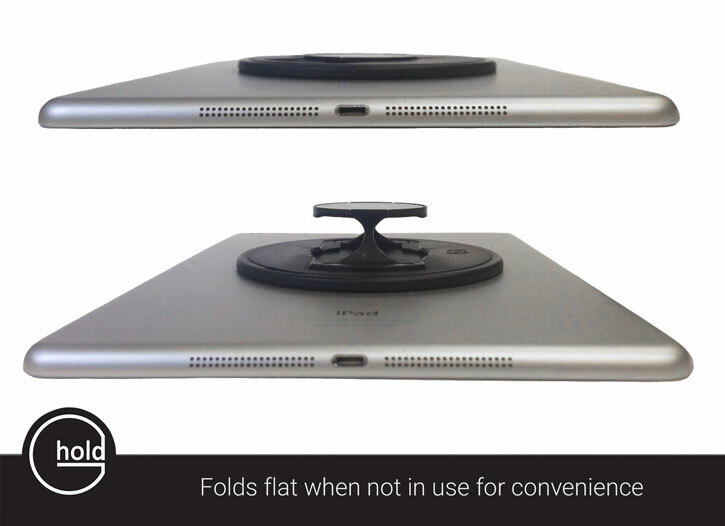 Meaning you can hold your tablet comfortable in whatever orientation you wish. It's all well and good having a G-Hold attached to your tablet but will it get in the way when i want to put it in my bag or slot it into a drawer? No, not at all. Just push the G-Hold flat until you hear a nice click and you're done. It only adds 5mm thickness so won't get in the way. Should you need to remove it though, don't forget, you can take it off and stick it on again in seconds - as many times as you wish. This is a classic piece of British design and engineering. Don't just take our word for it, it has already been scooping up awards and accolades, including: Start-Up Britain winner, John Lewis "Pitch Up" Winner, The Drum Scottish Design Awards Finalist, Scottish Edge Winner and International Trade Awards Finalist!